Leg numbness chiropractor with pain and tingling warns the knife awaits. 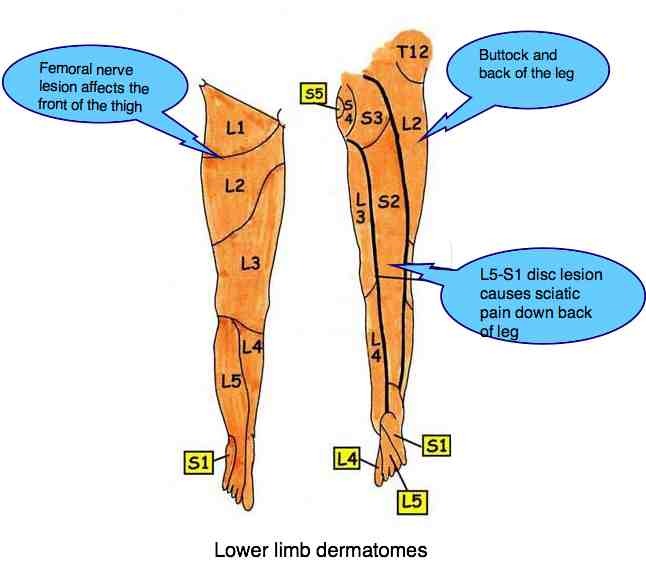 Leg numbness chiropractor urges prevention in the early stages of sciatica or femoral nerve pain. The vast majority of folk with serious symptoms radiating down the leg admit to the fact that they've been having warning signs for weeks, and often months. 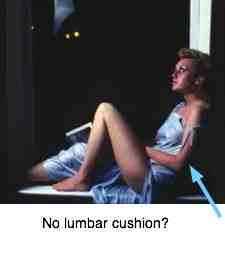 It's fairly rare for a full blown sciatic or femoral nerve lesion to come on overnight. The key is to take it seriously before an operation looms at great cost and uncertain outcome. 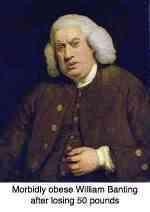 Medicine itself coined the phrase failed back surgery. Don't let it happen to you. The progression from lower back pain > leg pain and tingling > actual leg numbness or weakness is a very worrying trend in your back. Grade I: Lower back pain only. Grade II: Lower back and leg pain or tingling. Grade III: Lower back pain and leg numbness. 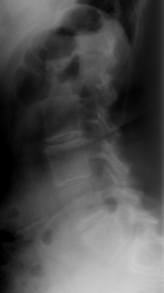 Grade IV: Lower back pain and leg numbness and weakness. Grade V: Minimal low back pain but severe leg pain. So, where are you on this journey from simple uncomplicated low back pain to the surgeon's knife? It's a sobering thought that almost every spinal operation started with a small, simple, curable problem. But, if you are having troublesome low back pain, research shows that folk who regularly bend and try to touch their toes are likely to get worse. For your lumbar spine, you can achieve the same stretch by lying on your bed and pulling your knees to the chest. But, whilst we are on the subject of bending, I'm sure you want to know if you are at grade one, or five. Flex slowly forwards; does it hurt only in your back, and is the pull or pain the same in both legs? Then, if you are a youngish person, read less than 50, then you are probably at grade one. But if one leg is much tighter, sore, tingly than the other, beware. You have progressed to grade two or more. Research clearly shows the more you sit, then the worse your back is likely to get. There are exceptions. And when you sit, use a cushion in the small of your back, like granny does. She may be old, but she's not so dumb! But, seeing you are sitting, here's the way to see if you are really progressing from grade one, towards the surgeon's knife. Don't get me wrong; I'm a chiropractor and every day we are treating patients with pain in the leg. Leg numbness chiropractor is what we excel in. But even better, prevention. Don't allow your back to progress from one to five. Lower back pain is in epidemic proportions in the Western world. Old injuries not properly cared for at the time and, worst of all, folk who continue with their daily lives with no change of lifestyle by taking anti inflammatory drugs over an extended period, almost invariably end up with severe nerve impingement; pain, tingling and numbness in the legs. Leg numbness chiropractor doesn't just happen to other people. The Slump Test for sciatica is done whilst you are sitting; it's a very useful tool that can use at home to see how you are progressing on this journey from a grade one in the direction of the surgeon's knife. Whilst sitting, a friend raises first the good leg, and then the naughty leg, adding progressively more stress on the sciatic nerve. The interpretation of the test is not straight forward, but it will give you a good indication of where you are on this journey. Are you on the way to leg numbness chiropractor, or even worse leg numbness surgeon? So, let's assume when bending, the naughty leg is much tighter, or painful compared to the other leg. When you do the Slump test, it's not only your back but your leg that hurts. Have you progressed from grade one to three on this road more and more frequently travelled? Do you have actual numbness in your leg? Take a clean pin or needle and prick your leg, comparing the normal and the naughty leg. The sciatic nerve is mostly likely to affect the back of your thigh and calf and the side of the foot, or the area in the web of the great and second toe. L4 L5 S1 S2 S3. Femoral nerve is likely to give you numbness on the side of the thigh, groin, front of the upper leg running down to the knee and inner lower limb. L2 L3 L4. In the early stage of the condition, the leg becomes MORE sensitive than the normal leg. Ignore the sensory change, and it switches over to leg numbness. Now we are getting into the serious stuff. You've established that, yes, you have numbness. It's still not too late for you to consult a chiropractor, the road less traveled, but you are well on your way in the other direction; the one to the surgeon. An MRI scan would be very useful at this stage. These tests pertain mainly to sciatica; however there is another large bundle called the femoral nerve coming from the mid to upper lumbar spine that produces very different signs and symptoms. This will affect the front of your thigh and the leg numbness extends down the inner shin; the Slump test will be negative. Femoral nerve injuries tend to affect the older person whereas sciatica affects young and more elderly patient alike. Is your leg also weak? What in anatomical terms, we call paresis. The question is, can you raise your heel, your big toe, and bend your knee without the knee giving way. Whilst most acute episodes of lower back pain will resolve, 5% go on to the full blown nightmare. If you have any of these ominous lumbar signs then you would do well to heed them, and in particular make sure you are doing these lower back exercises faithfully. "Luckily, fifteen minutes a day spent doing back exercises have taken away almost all of my pain. But I have to do them every single day; there are no short cuts with back pain." Help for sciatica pain is a daily business in the chiropractic clinic. Difficulties arise when the symptoms and signs do not fit with a typical pattern. Chiropractors treat lower back and leg pain successfully on a daily basis; in fact, medicine's own research acknowledges that manipulation is more effective than taking anti inflammatory drugs. Whilst manipulation too has its dangers, they are nothing compared to the danger of an intestinal bleed; it's one of the known and not uncommon side effects of NSAIDs. Around fourteen thousand people die every year in the United States directly from an ulcer caused by medication. But to achieve something even vaguely approaching a cure requires a commitment to the treatment, slowing down for a period and religiously, with great fervor, doing the lower back exercises. On a fairly regular basis, I have a patient who comes for an examination for lower back and leg pain; they feel perhaps sixty percent better after five treatments, and then cancel the next consultation because they feel they cannot afford the care, or other reasons. Three months later I get the surgeon's report. One of the less common conditions in the practice, and so it's so easily missed when it comes up, is irritated superior cluneal nerves that supply the buttock and some authorities say the groin area also. 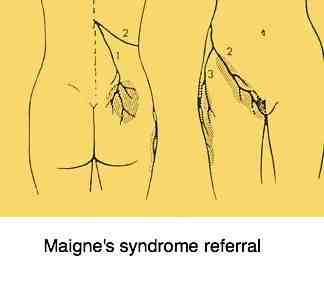 Named after a French surgeon, Maignes syndrome is the referral of pain from the upper lumbar spine down to the buttock and sometimes groin area.